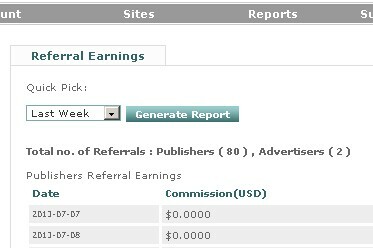 My Referral Report And The Referral Earnings From CPMGO.COM | AdsWiki - Ad Network Listing, Reviews, Payment Proof & Advertising News. I have already referred 80 publishers and 2 Advertisers. But I only got $15 referral earnings till now. So I think most of the Referrals havent active they tags. Cpmgo is paying. The minimum payments is $5 and pay daily via PayPal. Why don’t you try them? We introduce a quick and easy way to earn money by simply referring friends, family, co-workers and acquaintances who owns a website to join our CPMGO.com publishers program. You will receive a 10% lifetime commission out of the publishers you refer. There is no limition on the number of people you can refer and in this case the more the better. I’ve got two referral reward from Payoneer!